Wow…where did the summer go? Summer has passed me by in a flash! Despite the cold wet spring and vicious storms our Maine farmers have brought us a bounty of goods this year. Our club is steadily growing and the number of clubs continues to grow across the State. Thank you to Barb Rajaniemi for the gorgeous picture of the goods she purchased in this week’s order. 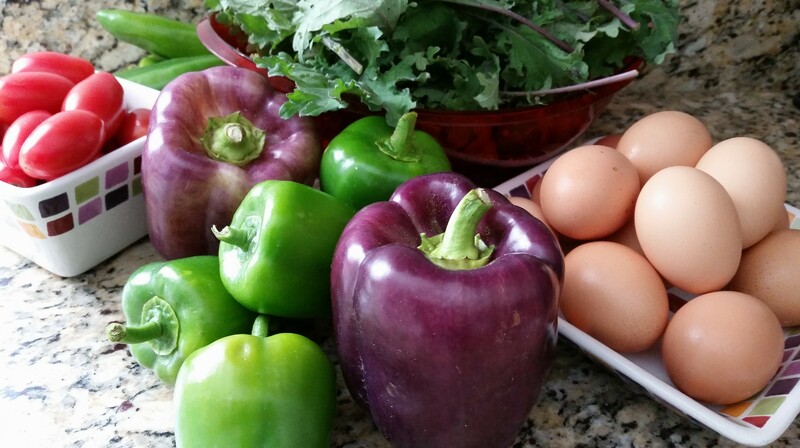 Organic purple peppers from Levesques and the rest of her haul is from uber local producers…baby kale, lipstick peppers, sugary sweet tomatoes and eggs from happy chickens. – Clay Hill Farm providing us with choice cuts of naturally raised beef and broiler chickens. – Thurston’s Family Farm with a large assortment of fresh veggies and pure maple syrup. – Tripp Prmial Farm & Kitchen specializes in gluten free and veggies goodies ranging from BBQ sauces to insanely awesome cdouble hocolate chip cookies. I must say that life is good in the River Valley…if you haven’t joined yet…WHAT ARE YOU WAITING FOR?